In the past few months, I’ve produced Charlie Trotter’s (or was it Thomas Keller’s) Acorn Squash soup three times. That’s in addition to the indie soups I’ve made for the blog every week. I cooked it twice playing sous chef for the Italian wine dinner my wife and I worked on and once as an extra for my mother-in-law’s birthday party. It’s a great soup. Really. You should try it. But as I’ve said before, I’m not crazy about stealing recipes from other chefs, especially chefs with blockbuster profiles. So you’re not going to see that recipe here. Of course, that doesn’t mean the acorn squash should suffer. This green-skinned winter vegetable has many fine qualities and doesn’t deserve to be blacklisted just because yours truly has dropped a few names. Yet somehow, ever since I began working with the acorn squash back in September, it has been noticeably absent from the cast of any Soup Blog production. Not that reviews matter to this coconut-sized vegetable. It has a very thick skin after all. The acorn squash didn’t even complain when I cast it alongside a non vegetable co-star. And even though it received top billing from its restaurant luminary friends, this hard-working squash got right to work in this feature role without a trace of diva-like behavior. Nor did it keep its fellow actors from getting the attention they deserved. Naturally I wish I could offer the acorn squash a grander stage, but I know the vegetable will not take offense. It is one of those rare players who just loves to perform and is happy to offer its unique flavor wherever it makes an appearance. Right, well, enough previews, it’s time for the main attraction. Note: Parental discretion is advised. Maybe I’d better just stick with a lightweight romantic comedy about a carbohydrate and protein who meet during a chance encounter in a soup pot, endure at least one very heated situation and wind up happily married. Preheat the oven to 350°, slice the squash in half, set face down on a cookie sheet and place in the middle of the oven until the squash are soft (45-60 minutes). Combine sausage and garlic in a 3 quart pot and simmer of low heat until the sausage browns nicely (7-10 minutes). Use a big spoon to remove the squash seeds (You may bake these later, if you like. ), then scrape the cooked squash out of its skin. When you’ve removed all of the squash, place it in the pot with the sausage and garlic. Add the stock and seasoning to the pot, bring to a boil and reduce to a simmer for about a half hour. Puree the soup with an immersion or bar blender until any chunks of squash are broken up. There will still be chunks of sausage, but that doesn’t bother me if it doesn’t bother you. Serve with a sprinkling of minced parsley atop the soup. 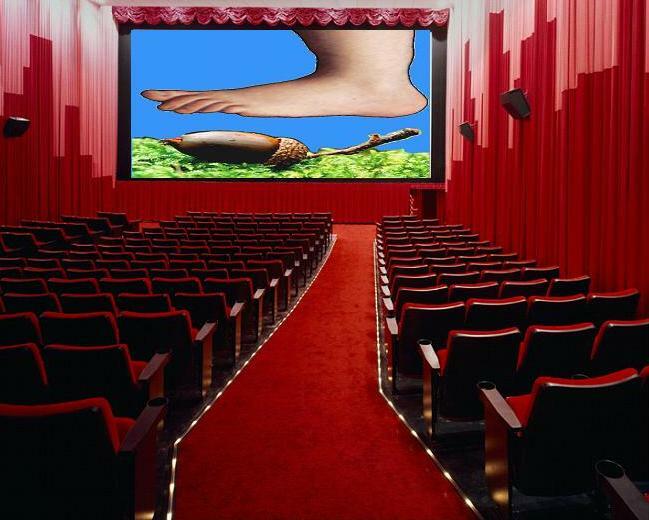 Image Credit: “Acorn Squash, the Movie,” Another clipart mashup by the author. I don’t know how many thumbs up Siskel and Ebert/Roeper & Ebert or any of those other guys would have given this soup. Personally, I’d use a spoon. I’d also rather hear your opinions about my latest feature. Leave a comment. I’ll be reading and responding. Very funny Phil! Maybe with new post production time I can get some soup making done. H Thanksgiving to all! Happy Thanksgiving to you all too. Good luck with all that soup making. The extra time should come in handy. OK, I keep hearing about your immersion blender, but could you please reveal which one you use? Macy’s sells the Cuisinart blender, but the Macy’s saleswoman told me she prefers KitchenAid because it’s longer and has more speeds. Which do you prefer? Or do you have some fancy chef’s brand not sold in stores? I like the KitchenAid. That’s the one I use. I haven’t tried the Cuisinart myself, but it looks just fine. I use it for pureeing soups, making salad dressing, the whole shebang. The only thing I would warn you about with an immersion blender is getting one with a plastic claw (actually I don’t know if that’s what it’s called. It’s the part you submerge, not just the blade.) I’ve used plastic blenders before and melted them in my soups. That’s not good. It’s a great tool to have. Good luck with it. Thanks for reading.